One of our fav designers, Lexie Barnes, doesn't just design great laptop bags - she also designs totes and other organizing bags for crafters, knitters in particular. I use circular needles a lot (less stabby than straight needles) but I do find them hard to keep track of, since they don't sit nicely in my needle carrier. I also have a set of interchangeable needles, which I tend to keep in their original case to save confusion. 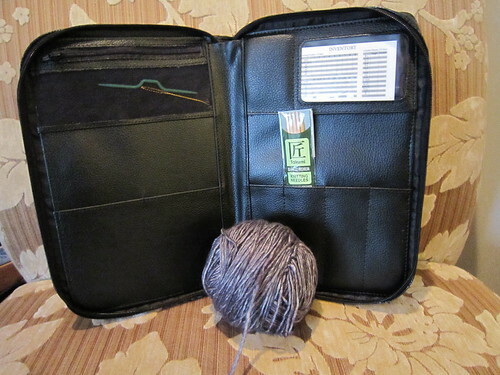 BUT I did recently pull out an interchangeable circular needle to use with a specific pattern and I knew that if I put that needle back in the case, I would forget which size I meant to use. So my first circular needle sleeve was graced with my interchangeable needle AND the one page pattern it's meant to go with. Handy! Some of the circular needles don't have the size printed on them, which is annoying. So I keep them in the original packaging. Fortunately, there's plenty of room for both in the sleeves. I tried not to pack larger size needles together, to keep the sleeves from getting too bulky. No one wins when needles chafe. You can read the full review of the Coco over on the knitting bag site. Also - very important - Lexie is having a HUGE Spring Sale for Knitters on RIGHT NOW! Tom Bihn Releases Their Swift Knitting Bag in Cork! 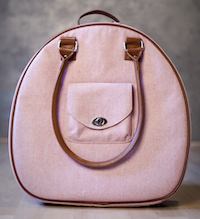 I adore Tom Bihn bags - I've particularly liked the Archetype Laptop Sleeve, the Smart Alec backpack is my go-to travel bag, and both Rose and I are big fans of the Swift knitting bag. So, I'm delighted to see that Tom Bihn has released the Swift in the cork material that they use on the Archetype. Delightful and different!